This was easily my most enjoyed anime this season, more so even than Kill la Kill. Now grant, Kill la Kill is right on Log Horizons toes, and I'll be writing its end post tomorrow...*cough* ok maybe today is technically more accurate and I should start going to bed...more than once every two days. Kill la Kill probably has a higher enjoyment rate on an individual episode-by-episode comparsion, but the sum totals of the two shows aren't a competition at all, for me anyway. The end episode of Log Horizon boldly announces that season 2 is already coming. I want to take a moment to reflect on that. Right there, at the end of the show, they pledge a season two. I can't honestly think of a time I've seen this before. I have the vague impression I have, but I don't put stock in those kinds of memories anymore now that I know I have a habit of manufacturing them. It may sound corny, but this bold declaration *sigh* restores my faith in humanity, particularly in the anime lovers community. Log Horizon came out the same time as Kill la Kill, Strike the Blood, and two magically themed shows. It says a great deal that in the face of so much competition from popular genres, Log Horizon secured enough popularity for them to have already gotten whatever it is they need over there to declare it worthy of a second season, in time to announce it at the first seasons end. Think about that. The glorious gem that is Spice and Wolf, (which, by the way, gives off the same kind of impression as Log Horizon...Just saying), had an aggravatingly effervescent information trickle about its second season, or if there even would be one, for someone like me who doesn't dig deep in the anime news, and just skims the headlines. Perhaps, (I'm beginning to notice that I start alot of self-detrimental brooding with perhaps), I simply don't know enough about how the anime industry judges what's worth additions. Maybe I'm just reading too deep. Regardless, the observation is still a useful one, think about it. -Weight. Log Horizon often skims, if not outright features, subject matter that is quite deep, and never trivializes the discussion of it, although sometimes it's brutally shortened into a summarized format. -The World presented has great potential for action, but other than one major fight near the end, the action tends to be somewhat underwhelming to the feeling the show presents of what it could be. The preview scenes of the second season seem to promise more action. -It has come to my attention that some people judge anime based on romance. 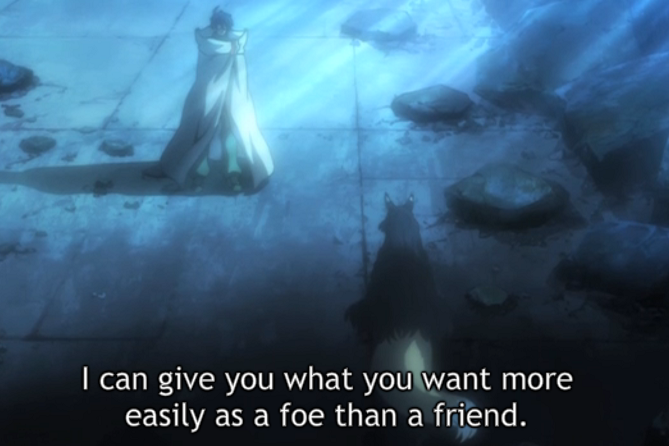 Romance is a sub-element in Log Horizon. It's there, and it's not weak, but it is definitely not the focus. I don't mind or care, but some people might. -If you take a disliking to Shiroe, for whatever reason, the show may be a poor experience for you. While he's not the exclusive focus of the show, and everyone gets great development, he is definitely the primary amongst the leads. You spend alot of time focused on him throughout the show. I doubt there should be many people that would be so unhappy with him, but fair warning, I guess. It is not my place to hand out Evil Cat's Awards, but that's not going to stop me from having my own set of them to pass out. (and no, there will probably never be a comeback gem award ever again, that was mostly a joke. mostly).Everything, even down to the name, is tight and well fitted in Log Horizons world. How can I give out this award, you might ask, when the show has a second season lined up? When it should be incomplete with just one season? Simple, the plot isn't finished, but this story arc is. Just because there's more or another story to tell, to continue the plot, doesn't mean you can't finish a season or show without plot holes. Plot holes are never good, and with proper planning and work, never necessary. Yes, the ending may still be bad if it's forced to end an anime, when the original story continues, but that does not mean plot holes. An ending can be whole, and still bad. Log Horizon could have a second season never come, and it would still be a complete story, and well worth reshowing. Impartial Judgement: Perhaps a deep story, plot, or well detailed world isn't the taste you're after. To each their own, after all. Not everyone likes books, not everyone likes movies, not everyone likes video games. Some people like action, some romance, some intrigue, and so on. Log Horizon is more about its interesting story, world, characters, and the intrigue between them all, than it is about anything else. There's alot of 'anything else' in there as a result, comedy, romance, action, but the focus is definitely more intrigue, drama, and human interest than anything else. That's not all of it, and it's not even the majority of it, (that would be the most boring anime, lecture ever), but it is the core. If you put Log Horizon, and Sword Art Online up on a pedestal with each other, you get a nice contrast. While both feature human interest, SAO is more about drama, romance, and action, while Log Horizion is more about Intrigue, Humanity, and drama. Log Horizon may not be THE BEST THING EVAHHH *cough*, but what it is, is solidly made, presented, and executed as an anime. If the second season doesn't end the plot, I'm going to be looking for the original story source, if there is one. I'd love to tell everyone 'you need to watch this! ', and the rapid promise of a second season encourages it...but I know better, not everything is for everyone. Never-the-less, Log Horizons a good interesting show, and you should at least try it.